I'm not numbering the muslins for this jacket anymore. I cut the block, without collar or any other styling, twice but did any number of small alterations to each of them before making the next. What I showed you here before was the second one, but before I changed that. The fact that the fabric I used for the muslins ifrather soft and sticks to all my clothes doesn't help matters. ther tweeking at the shoulder and a small swayback adjustment (I often find these to be over-used in the sewing blogoshere. They come up a lot and in many cases I think the real problem is the waist length. But I drafted this thing to my waist length... It was also just sticking to my skirt pretty badly in that picture, so quite a bit of the bundling was down to that. I overlooking one thing though: wearing heels changes your posture. It causes or increases swayback effects. And I would like to wear heels with my suit). Then, I started drafting a collar. And I shaped the bottom edge. And adepted that hard-won shoulder shape. I wanted to try out a banded sleeve head. So, in this muslin, there's one normal sleeve with a shoulder pad and the other has the banded sleeve. I shortened the shoulder a bit for that. And then the fretting began all over again. I had just about convinced myself that it would be OK and the strange bagginess at the chest would sort itself out in the end-product by the use of the appropriate stiffeners. And then, I took pictures to post here. Eew... I's so not there yet! Oh, and I did notice I've been too careful with the swayback adjustment, there will be a bit more of that too. By the time I figured out all of that, it was already getting a bit dark, so you will get to see yet another version of this muslin later. Well, not quite. I'm just not in the habit of mentioning every fabric purchase here. Of course, there are always those projects which require not-in-stash types of fabric. Those purchases, I think, are perfectly excusable. And then, there fabric-buying like this. Which has nothing to do with what I need for any project currently in preparation and everything with how I buy fabric. 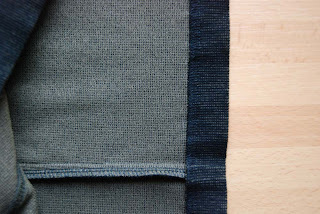 You may have noticed frequent mention of sales and the market when I write about my fabric. And there's the reason. I really only buy at the fabric store when there's a sale on (very specific things like swimsuit lycra excluded). And then, I go for fabrics I know I love and will eventually use. Nice wools, mostly. At the market, it's a different game. 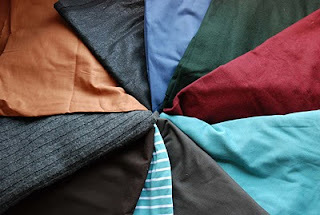 There's a lot of really nasty synthetic fabric but, if you can find those specific bolts among all the others, there are loads of nice, good quality cottons (knit and woven, printed and plain) some decent viscose/rayon and blends and in winter even some proper wool suiting and coating fabrics. Over time, I've become a master at spotting a bargain and I have my stash to proove it. To my defence, there's one big drawback about shopping for fabric at the market: when it's gone, it's gone. Many sellers buy up left-overs, so, quite often, there's just one bolt any given fabric. Which is why I bought the pale blue/grey wool coating on the right. I don't really need a new coat and I still have black wool for one. But this funny colour might just work on me and it was only 2 euros a meter... I bought 2 meters at first. When I got home, I draped it over my shoulders and played around with it in front of the mirror. And decided this would be a great fabric for that New Look-alike coat I still secretly want. For which I would need more fabric. So, because it was still there, I bought another 2 meters. The other fabric in this picture is a first for me. I bought it at the same stall where I get my vintage gloves, handbags and the occasional silk shirt. This time, they had hardly any clothing at all and piles of fabric. There were great 60's and 70's prints but unfortunately those were all on 60's and 70's synthetics. So I didn't buy any of those. The blue fabric is not something I would usually go for but it's a very soft and drapey cotton/viscose blend (I think) and that old-fashioned print could be fun. It's a small piece, but it should be enough for a short-sleeved blouse. The beige is felted wool. 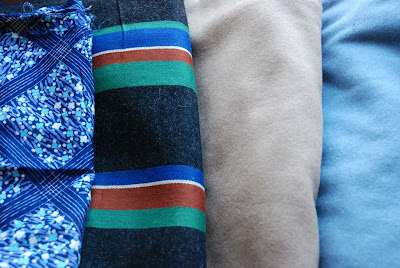 A classic fabric and colour for a coat. It's just enough for a simple coat and the colour should work for me if I make a design which doesn't put the fabric right next to my face. The grey with stripes is wool too. Almost 5 meters of only about 90 cm wide. 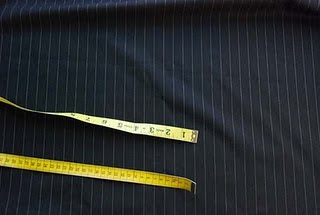 Those stripes are wide along one edge, and every new set of them is narrower, ending in a one coloured pinstripe. It is interesting but will take some time and imagination to become a piece of clothing. These three fabrics cost me the grand total of 4 euros. It is rather likely that all the wools will spend the summer in the stash but is that necessarily a bad thing? And they all have colour as well! Or, to be perfectly honest, no.3. The first one, straight up from the drafting instructions, was almost the same at the front but seriously baggy at the back. I tinkered with different ways to solve that and tried to decide just how fitted the jacket should be. I also struggled with the shoulder width. I know the shoulders still look like they 'droop' down now, but I think that is partly the fabric and partly the neckline pulling the front open (I just took the pictures this way because it looks more jacket-like). And I don't think I should have a very narrow shoulder in this kind of jacket. This week was pretty busy, and we had more of those grey days, so I didn't get the opportunity to take pictures of all stages. You didn't miss much though. Please be aware, when viewing these pictures, that this fabric loves sticking to my top and skirt. The muslin is wide enough in the hip and the back waist length is fine, although you wouldn't say so from the back shot. I think I'm getting closer to where I want to be (more of less the fit of the orange jacket). I'm still wondering whether I should take a bit off at the front of the arm scye and there's some weird bit of extra fabric at the top of the back neckline. I think I'll try those things by tweaking this muslin. After that, it's time for the fun stuff. Deciding on style. I already decided not to make one of those 'fitted at the waist' jackets time. That's why I drafted this new block in the first place. But there are so many more things which can make or break a jacket. 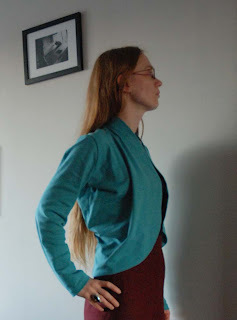 Am I staying with this length, or do I go a bit shorter (the latter I think, I like the length of the orange jacket)? Vertical at the bottom, like the block, or a slight flare? Do I add side vents or a center back one, or don't I? I will use at least a small shoulder pad, and raise the shoulder accordingly. However, what size to use? And do I want a normal sleeve or one with a seam, band or darts? All of these are classics which have been back in fashion this winter but, having said that, that very fact may cause them to look dated much sooner than normal shoulder would. And then I'm not even starting on pocket options yet. Which is because I will have to decide on the stuff mentioned above when I start drafting the actual jacket. I can add pockets to that when I'm satisfied with the silhouet. Finally, it was a clear day today. 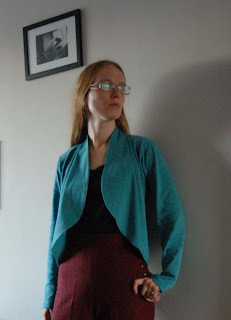 So, in a little break from my 'obsessing over jackets' posts, I can show you the cardigan I made last week. The one which I feared would also be destined to fail. I think I kind of saved it though. What can I say about it? Of course I made the pattern for it myself. And I tried to be quite clever about it. I wanted a round open front with nice draping, a normal set-in sleeve and a collar. The pattern I made has no side seams and just a small upper back piece. The rest, collar, front and lower back, is all one large curved piece. I made the sleeves a bit wider than usual so I would be able to wear this over things with sleeves as well as over tank tops. As I was sewing it together, I found out the draping ended up much more on the side than at the front. I should have realised that would happen, but I hadn't. There wasn't really anything I could do about it at that point, so I just finished it to see how it would turn out. I ended up taking about 10 cm off the original length. I'm Ok with it now. It may not be entirely what I envisioned but doesn't look that bad and it fits really well in colour plan. In fact, it really is the kind of colour which goes with almost everything in my wardrobe and instantly brightens up any outfit. Thank you all for your thoughts on the jackets. I totally agree with most of you that, for the purpose I described (wearing open, mainly over trousers) the looser shape of number four is way better. I am however seriously considering making a big wide black skirt, in order to take full advantage of the New Look-like potential of one and two (I have studied their one-sided crease in the back, and I think I know wear it comes from: there are no shoulder pads or rigid back stay and I am standing twisted ever so slightly sideways in all the pictures). Some of you wondered whether the 'wearing open' issue was caused in some way by the shoulder of the jacket. Well, I can tell you what it is. 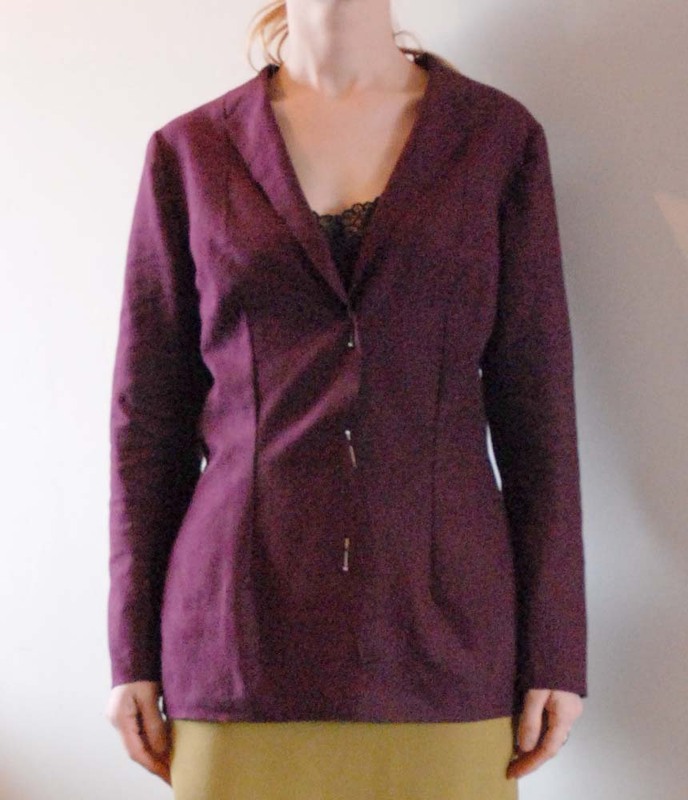 When drafting my first jacket (not pictured), M. told me I didn't need a seperate block, I could just adjust my sloper. And so I did. But, over-enthousiastic as I was, I did so at home. 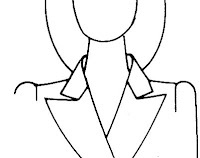 Changing the two-piece (front and back) sloper into the three pieces of a classic blazer. Because I had just made a coat in which I ended up having to take out a lot of the extra ease we added, I hardly added any now. And I didn't pay close enough attention to any other differences between the two slopers. Yesterday, I checked those two and immediately noticed it. The bust dart. The less fitted blazer sloper has a much smaller bust dart. It also has a larger arm scye and a wider neckline. Between the extra ease and the flatter shape of the front bodice, I think I have found the problem. The narrower fitted bodice block must result in having more material on the upper chest, just under the shoulder. I drafted the blazer sloper according to my measurements. The front looks good but the shoulder was a bit long and I'm still considering the fit at the back. I'm now trying to tweak it. Unfortunately, it was another grey day so I couldn't take any pictures. Hopefully, this weekend will be better. You might wonder why I'm so obsessed with a 'perfect classic jacket'. Or even what I mean by that. I'm not sure why. It might just be because it's such an iconic garment and, partly because of that, one of the biggest tailoring challenges to get right. And to me, the one picture I'll always have in the back of my mind when talking about a classic black jacket is this (please ignore the text in the picture. I scanned a magazine clipping). 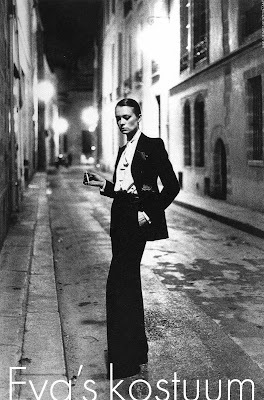 Helmut Newton's famous photograph of Yves Saint Laurant's famous ladies smoking. I want this suit. And I want to make it myself. I bet most of you would want it too. It's such a strong image. Funnily enough, I borrowed this book on draping (link goes to the English version, the original is Dutch. If you are Dutch, look for that in the Netherlands. It will be a quite a bit cheaper) from the library last month, and it had a tutorial for 'le Smoking'. Unfortunately, the muslin suit made there looked block-y and dated (which makes perfect sense, if I'm not mistaken, it dates from the early 80's) and didn't live up to the dream image I've created from this picture. P.S. In completely unrelated news, I had a nice surprise on Wednesday. I went to the local market to buy fabric for some clothes E requested (I'll get back to that later). At one of the stalls, I had to wait for the seller to finish unpacking. I was just being me, chatting with the seller and offering un-asked for advice to other customers (yes, I can be little miss know-it-all...). Then one of them, an elegant lady who was picking out jeans, turned to me and said: "do you have a blog called petit main sauvage or something like that?" 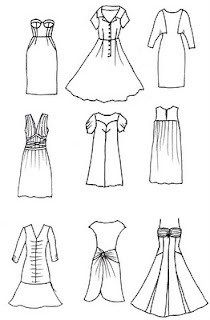 Next to my ill-considered plans for a 60's dress, one or two suits were also among my more immediate sewing plans for 2011. Which leads me to this post. The first suit I want to make should become my ultimate black suit (for the second, I've got brown-grey fabric and I'm considering side buttoned trousers and a vaguely victorian inspired jacket). I've got some very nice black wool suiting in my stash and I want to make two or three pieces which can be mixed together and with other items in my wardrobe. With these criteria in mind, I would like to ask your opinion. I'm going to run some option past you and would like to know which of those, which combination or which other one I should consider for my ultimate black jacket. First: my lovely tweed jacket. 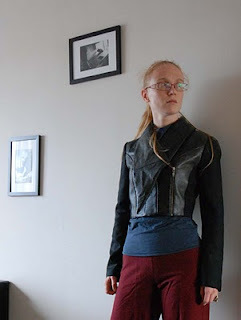 The second jacket I made to a self-drafted pattern (the first had some strange issues and is black, so I'm not including it here). I really like it, but the result is somewhat 'Edwardian'. I'm also not so sure it looks good when worn open. 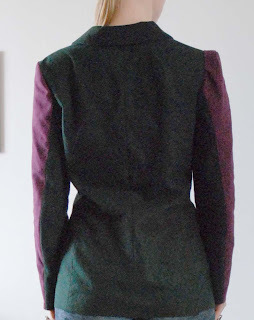 Second: A green tweed double breasted jacket. The basic shape is the same as that of the grey tweed one. 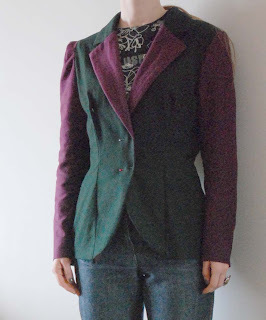 I made this (in a cheap fabric and with less interfacing) purely to see whether or not double breasted jackets looked good on me. This one sees a lot of wear as a late spring/early autumn coat. The higher neckline caused by it being double breasted makes it suitable for that. It should get a collegue for that role, but I don't think it's an 'ultimate jacket' option. Even if it's just because it looks a bit funny when worn open. Fourth: I didn't make this jacket. I found it at the vintage selling market-stall. It is a rather straight cut which, on me, is fitted at shoulder and hip and just hangs loose between those. I like it. The shape seems modern and a bit androgenous. And it looks good worn open. Of course, when I make my jacket, there will be muslins and style and fit tweaks, but each of these has a different basic shape. 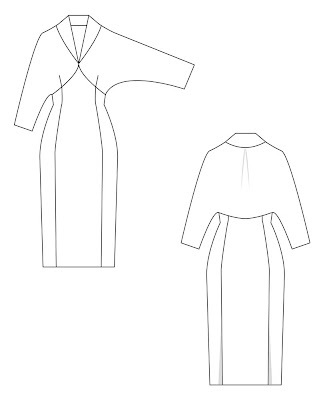 It's not a lot of work to change the length, or the exact outline of the collar, drafting an entire new shape is. Which is why I want to start with a clear goal in mind. In the new jacket, there may also be more extensive tailoring than in any of the above, but I'm still mentally debating the merits of different techniques. I will follow up on this with a post on jackets and trouser shapes but until then, can you help me out? My dear ladies and gentlemen readers, I wonder, is any of you under the delusion that, either by years of obsessive practice or by some form of supernatural interference, I am incapable of having any of my sewing projects just not work out? Well, I'm not. Sure, the influences mentioned above may give me an above average hit-versus-miss rating but I'm by no means immune to any of the errors in judgement which commonly lead to failed projects. Picking unsuitable styles, poor fabric choice, haste? Experience helps to lessen the occurance of the first two, but the third can pop up at any moment. And experience and success breed their own particular error in judgement. Hubris. Pride at one's accomplishments, leading to a false sense of invulnerability. At the end of my last post, I casually mentioned I might just make a quick 60's dress, just because I could. Because I wasn't too sure about the style and because the colour was really nice, I used fabric, cotton flannel, left over from my red trousers. Of course, this style of dress being so simple, I just knew I could make this in next to no time. The pattern was easy enough. 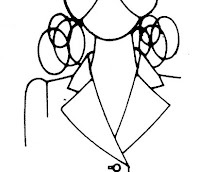 Curved french darts for bust shaping at front, the only waist shaping in the back darts, skirt widening to A-line below the waist. Afraid it would be too simple, I decide to make center front and back seams with 'cording' sewn on both sides into the seam allowance. Because I didn't have any cord of the right thickness, I used strips of fleece, sewn double. And because I was short on fabric, I made the sleeve about three quarter instead of full length. The end result, as you can see, is just mwah. And this is after ironing it. The seams for the 'cording' pull too hard on the rest of the fabric, making it all look a bit crumbled. And this style is just not that great on me. E, always an honest judge of how things look on me, didn't like it at all first time he saw it, got a bit milder after I ironed and decided it might sort of work with some crazily coloured thights (I only have bright red, which doesn't work with this colour). I was disappointed by this thing and I should remember not to be tempted to make anything in a hurry. To make matters worse, I'm now finishing a cardigan which, also, didn't quite work out as planned. I that case, I may just have been trying to be too clever for my own good... I'll show you when it's finished. I made this dress literally in the last bit of 2010. That is, I sewed it, all of it, on December 31th. If I remember correctly, I made the pattern in the evening of the 29th, finishing it and cutting the fabric on the 30th. The basic design however, which I sketched in a soft pencil which the scanner really doesn't like (I've just added the tech drawing I made this morning), is at least half a year old. It certainly pre-dates that of the kimono-inspired retro-dress. It had been lingering on my desk, waiting for the right season and the right fabric. The dress has a sort of empire-line bodice with kimono sleeves and a shawl collar. The skirt is cut in 6 panels reaching up in a point at center front. It has single pleats at the bottom of both sides of the center back panel to create extra room for walking (although the stretch alone might have been enough). There's a blind zipper in the left side seam. The fabric was bought a few months ago. I don't really know what colour to claim for it. Most of the fluffy outside fibres are black, and it's beige on the inside and some of that it visible too. It was on sale and very cheap (0,50 euro a meter, if I remember correctly, with 2 meters left on the bolt). I wouldn't have bought this stuff otherwise. It's a very peculiar knit which only stretches lengthwise. So, I had to cut everything on the crossgrain. It is also a mystery fibre with a huge difference between the right and wrong sides. On the wrong side of the fabric, you can actually see the plastic-y filaments which I guess are the lycra threads that give the fabric its stretch. It makes the inside surface a bit rough and the fabric is a bit stiff but, made into a garment, it's surprisingly comfortable. I had planned a lining but decided I wouldn't need one. Because of its colour, it's very difficult to photograph, so I've added these extra poses in the hope of showing at least some of what this dress is like. I was really planning to do that on December 31th, but I was sewing a dress which just had to be finished first. And then there was a party to go to. And then there was a nasty little stomach virus which kept me in bed for two days. So here, we are, on Januari 3rd and although I haven't done this sort of thing before and although I don't really like the somewhat forced looking back and making of resolutions which the coming of the New Year always seems to inspire, I'll have a go. 2010 was my first full year of blogging, so it was also the first year in which I can sort of trace what I've made. Sort of, because I haven't always documented the more boring stuff. I would like to think I got a bit better at this blogging-thing. At least I dropped the 'weekly outfit' posts half-way through the year, partly because of time-by-daylight constrainsts and partly because I felt I no longer needed them as 'space-filling'. I also made appeals to your sense of style in my fairly long and well-documented struggle with pinstripe and, more recently, with velvet. In general, I've tried to stop simply dumping pictures of finished garments on this blog and instead, go step-by-step and show you some of the process behind the making. Because I make my own patterns, that isn't always easy. Until I sort of mastered Illustrator, I couldn't show a tech drawing and I will, with this way of working, never be able to show pictures of what the finished product should look like. Or make useful recommendations to others wanting to make something similar. I have made a few tutorials of projects which don't require a full set of tried and tested slopers and quite a bit of experience and/or background information on pattern making. Of the longer projects, I think last summers' dreamt-up dresses were nice. I didn't make all of them, partly because I didn't have suitable fabric for some. I think numbers 1,4 and 7 of this second line-up may still make it into reality at some point in the future. and the jacket from re-used leather. All in all it was a good year for sewing. I didn't do anything groundbreakingly new, but I did master my new sewing machine and serger, I made a lot of clothes I like, got more experienced in making patterns and more adventurous in trying out new shapes. 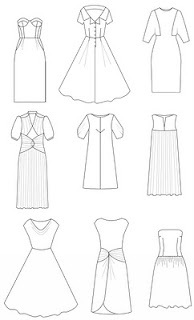 I'm going to show you my-just 2010 dress tomorrow and I have several, as usually not too well-ordered, plans for sewing in 2011. I would really like to make 1 or 2 suits before winter is over. And I'm thinking about a quick 60's dress, a mini, with long sleeves, just because. Happy New Year, everyone! And I'd love to read about your sewing plans.